1- Lexi Thompson (3) - After last year's controversial ending to the ANA Inspiration, I am going to assume she will be much more careful in placing her ball. I am also thinking she will drop a few more key putts this year. She was oh so close to sweeping all the major awards last year. Look for her to be the 2018 Player of the Year, and finish the year in the #1 spot on the Rolex World Rankings. Look for less controversy and more putts to fall for Lexi Thompson this year. 2- Sung Hyun Park (1) - Look for another terrific year from this young lady. I expect multiple wins, but a #2 finish. 3- So Yeon Ryu (2) - She will win at least once in 2018, but will have a very hard time keeping up with the numbers 1 and 2 above. Look for another solid season from So Yeon Ryu. 4- Brooke Henderson (6) - Many thought Brooke was a bit off last year, but she still managed a victory and a 6th place finish on the year end money list. Look for her to continue to win and threaten a top 3 finish. 5- Ariya Jutanugarn (5) - Ariya might be the toughest player on the LPGA to predict. She's capable of missing ten straight cuts and then winning again. Which half of her will turn up more frequently in 2018 is impossible to predict. So I will just place her where she finished last year. 6- Shanshan Feng (4) - Shanshan will start the year as the #1 player in the world. She will not finish there in spite of another solid season. 7- Lydia Ko (13) - I just refuse to believe that she can go another season without a victory. If she does, that will be a story all of its own. 8- Anna Nordqvist (8) - Just plug her in here in this spot every year and you can never go wrong. 9- In-Gee Chun (11) - Look for her to turn one of those many top five finishes into a victory this year. 10- Michelle Wie (19) - It was a big comeback year for Michelle in 2017. If she is healthy this coming season, look for a return to the top ten. If healthy, look for a return to the top ten for Michelle Wie in 2018. 11- Cristie Kerr (7) - Cristie had one of the finest years of her career in 2017. A year that included two victories. She is just 5 points short of gaining Hall of Fame membership. That should keep the fires burning. 12- Inbee Park (25) - Where she will finish this year is going to depend on how many tournaments she will play. If she gets 20 starts, she could finish higher than this. 13- Stacy Lewis (15) - I believe Stacy will still play well enough to sneak in another win this year. I believe she will also keep the money this time. 14- Minjee Lee (16) - I can't help but feel that she still hasn't shown us her best. When she does...watch out! 15- Jin Young Ko (rookie) - The favorite to win this year's Louise Suggs Rookie of the Year Award. I don't see her having quite the rookie year that Sung Hyun Park had last year, but a solid season is a sure thing. 16- Angel Yin (44) - She won on the LET late last year. Look for her to win on the LPGA this year. 17- Sei Young Kim (10) - A very solid player, but I see her falling back some this season. 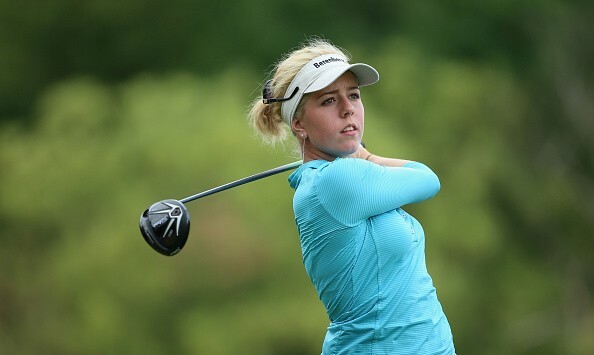 18- Jessica Korda (26) - If healthy this season, look for a bounce back year. 19- Nelly Korda - (47) - Closing the gap on older sister Jessica. Can Nelly Korda finish higher than sister Jessica on the 2018 money list? 20- Mirim Lee (20) - Look for her to finish right about where she finished last season. 21- Amy Yang (18) - I always seem to pick her too high. So I will drop her a bit this season. 22- Moriya Jutanugarn (9) - She is still looking for that elusive first victory. She led the tour in top twenty-five finishes in 2017. I don't expect her to do that again this year. 23- Danielle Kang (17) - She made a good chunk of her money when she won the KMPG Women's PGA Championship in 2017. She will have to win again in 2018 to finish that high on the money list again. 24- In-Kyung Kim (12) - She won three times in 2017, and still only managed to finish #12 on the year's money list. It is hard to pick her higher on this list when she sits out 50% of the tournaments. 25- Mi Hyang Lee (22) - Expect a slight drop off in 2018. But another solid season. 26- Marina Alex (27) - She gets better every year. No reason to believe she will not continue to improve. 27- Chella Choi (28) - Chella finishes about here every year. This year will be no different. 28- Georgia Hall (rookie) - I believe she will be one of the best players to come from the LET in years. She will have a solid season. Only question is whether or not she can challenge Jin Young Ko for rookie honors. Can Georgia Hall challenge for the Louise Suggs Rookie of the Year honors? 29- Mi Jung Hur (14) - M.J. had a career year in 2017. I look for her to drop back some in 2018. 30- Carlota Ciganda (24) - She fell back 10 spots in 2017. I look for her to drop 6 more this year. 31- Brittany Altomare (30) - Surprised us all in 2017 with a very solid season. Look for more of the same this year as she tries to continue to pile up some Solheim Cup points. 32- Brittany Lincicome (32) - Still capable of winning, but doesn't contend enough anymore for me to put her higher. 33- Charley Hull (46) - After finishing #15 in 2016, she fell back sharply last season. I believe she will rebound a bit this year. 34- Lizette Salas (21) - Had a very solid second half of the season in 2017. Putting together two good halves has always been her problem. 35- Megan Khang (43) - Played up to our expectations the second half of last season. Look for more improvement this season. 36- Suzann Pettersen (37) - If she is healthy, she can finish much higher than this. 37- Jenny Shin (36) - Fell back quite a few places in 2017. I expect her to play about the same this year. 38- Madelene Sagstrom (49) - Madelene had a very solid rookie season that got stronger as the year went by. Look for continued improvement this year. 39- Austin Ernst (33) - Austin is a solid player, but I don't see a big upside here. Look for her to play well enough to solidify a 2019 Solheim Cup position. 40- Jodi Ewart Shadoff (31) - Makes a high percentage of cuts, but doesn't contend enough for me to put her higher than this on my list. Player most likely to make me look foolish for leaving her off this list: Nasa Hataoka. Player I left off because she is expecting a child in 2018 and will probably not play enough: Gerina Piller. Only two players did not miss a cut or withdraw from a tournament in 2017. Can you name them?